Below is information on how to help a friend who has experienced sexual misconduct. Please see the second part of this page for some unique issues facing Male Survivors. Listen without judgment. It takes courage to share; be respectful. DO NOT criticize, downplay emotions, express disappointment or show shock regarding any action or non-action taken previously. Believe. It is extremely important to believe a survivor by verbalizing your belief, expressing empathy and sincerely sharing your concern. DO NOT blame the individual for any action or inaction leading up to, during or after the assault. It is never the victim’s fault. Be patient and sensitive. Understand the range of emotions and the time it takes to heal is different for every survivor. Allow an individual to make decisions about when and how to receive support; help him/her understand it is not their fault. DO NOT try to take control of the healing process. Empower the survivor. There are many resources available to survivors of sexual assault on campus and off campus; know your resources and share them all openly. DO NOT make decisions about any of the next steps without the survivor’s consent. Anger. Any anger, even towards the perpetrator, could make the survivor self-blame. Avoid anger, aggressiveness and violence. “Why” Questions. “Why did you drink so much?” or “Why didn’t you fight back?” These questions push blame onto the survivor. Avoid all why questions. Evaluating. “You shouldn’t…” or “You should…” or “This needs to be done.” The survivor lost their own power and control during the assault; give the power back and allow the survivor to choose the next steps in their own healing process. The healing process for a survivor will take time and everyone is different. As a person who cares about the survivor, you could possibly deal with emotional stress as well. Ensure you are taking care of yourself and empower the survivor to do the same. Reach out to available campus resources if you need guidance or support. Attend counseling; this could be with a therapist, advocate, social worker, etc. On-campus confidential counseling can be found by calling CAPS at 610-660-1090. Seek spiritual support; prayer, reflection, pastoral care. Men who are victims of sexual violence may experience some unique emotions. Men often have a very difficult time understanding or accepting what happened to them. It can also be more difficult for male survivors to seek help for fear of what others may think. Too often, society and the media portray sexual violence as a “women’s’ issue.” However, in the U.S., about 10% of all victims are male. Sexual violence is devastating to all victims, regardless of gender, and many reactions are shared by both male and female victims. 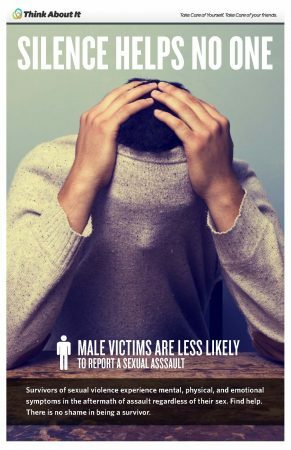 Like all victims, males may feel emotions such as rage, shame, guilt, powerlessness, helplessness, concern regarding safety, and/or symptoms of physical illness. Feeling somehow “responsible” is a normal reaction to sexual violence. However, sexual violence is never the responsibility of the survivor. While not every male survivor of sexual assault reacts in the same way, many reactions are quite common. May worry that the assault means they should question their sexual orientation. Relationships may be impacted by others’ reactions to the assault, such as a lack of belief/support. Avoidance of emotions or emotional situations, coming from the overwhelming feelings that come with surviving a sexual assault. The emotional impact of sexual assault is unique for each person. Regardless of how much time has passed, help is always available by contacting one of the resources listed on this site.